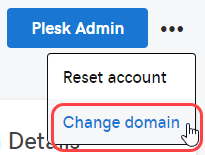 You can change the primary domain name on your Plesk Hosting account. This will change the domain name associated with your account's Web root directory. Required: If you have an SSL currently installed on your primary domain name, you MUST remove the SSL prior to changing your primary domain. Next to the Plesk admin icon, click the … and select Change domain. Note: This option will require that you update your DNS A record to the specified IP address. Click Change domain to complete the process. Note: This process can take up to 24 hours to complete. There is no charge to change your domain name. You can add a domain name to your hosting account. Or you can remove a domain name of your hosting account. You can save your website files locally by backing up your content.